2019 Fund Our Ferals Future! We are gaining momentum on a building for Feral Fixers! Our "Fund Our Feral's Future" Fundraiser will run from January 20th to March 16th. Please help us get our brick-and-mortar and continue to improve the lives of all cats in DuPage County and ensure our future! Mortgage payments, taxes, fixtures, they are all needed - please help! We have pledges totaling $12,500 - you can double the effect of your donations by helping us get our own building! Help us get our own building and FUND OUR FERALS FUTURE! UPDATE! As of 3/9 we have received additional cash and checks totaling $5,600 to match our promised funds! Thank you all for spreading the word, we have until March 16th to raise the additional $3,956 to fully match! Feral Fixers has been in existence for over 12 years and in that time we've spayed/neutered nearly 11,000 cats and have found forever homes for nearly 1,500 of them. But for our organization to grow, we need to move out of peoples basements and garages and into our own building. We have found a couple of buildings which show great potential and are now raising the money necessary to make this happen! This fundraiser is a very important part of this process and we need our wonderful donors and all those who believe in our mission of Trap-Neuter-Return (TNR) to donate now. We have pledges of $12,500 in matching funds so every dollar you donate as part of the Fundraiser up to $12,500 will be effectively doubled! Please help us to step up our game and help even more cats in the future - THANK YOU! I am helping to support Feral Fixers. This is an important cause and I’d really appreciate your help. Please spread the word and/or make a donation. Thank you so much! 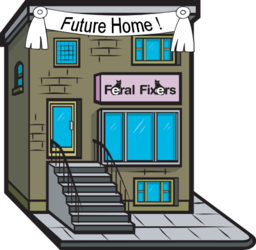 I just made a donation to "Feral Fixers." Please help me spread the word about this cause or make a donation yourself. Your generous donation goes directly to the PayPal account of Feral Fixers, less PayPal processing fees. GivingGrid.com does not take a fee from Feral Fixers. It's free to them.You do not need a PayPal account to donate. Please help a little more to support GivingGrid's operating expenses and keep the service free to Feral Fixers. Why? 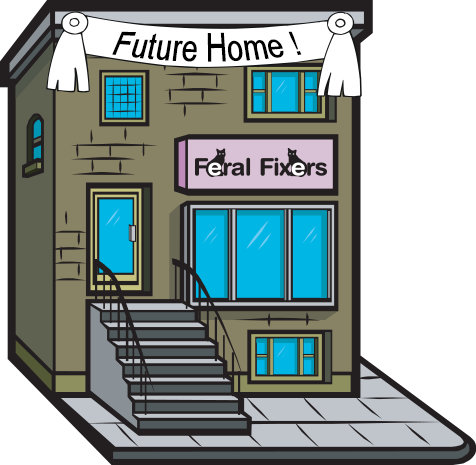 Unlike most other services, we don't charge Feral Fixers any fees. It's free to them.